So with 52 days to go until the Clash of Kings Tournament in March I thought it might actually be a good time to get my head in gear in try playing a game of Kings of War, what did this game throw up, well firstly I am woefully unused to playing Kings of War and secondly I need a lot more practice with my chosen army and possibly a few more revisions to my list. Well with half of my army blu-tacked on to the respective bases I think it already looks pretty respectable force, and I am suprised by how cool the force looks. As you can see I didn’t have time to tak everything down but the regiments are pretty much full strength and just need painting. 60 days sounds like a lot but when working shifts that time soon vanishes. So on to the game, my opponent Leon was running Elves and I made the stupid, bone headed, unforgivable mistake of letting him go first. 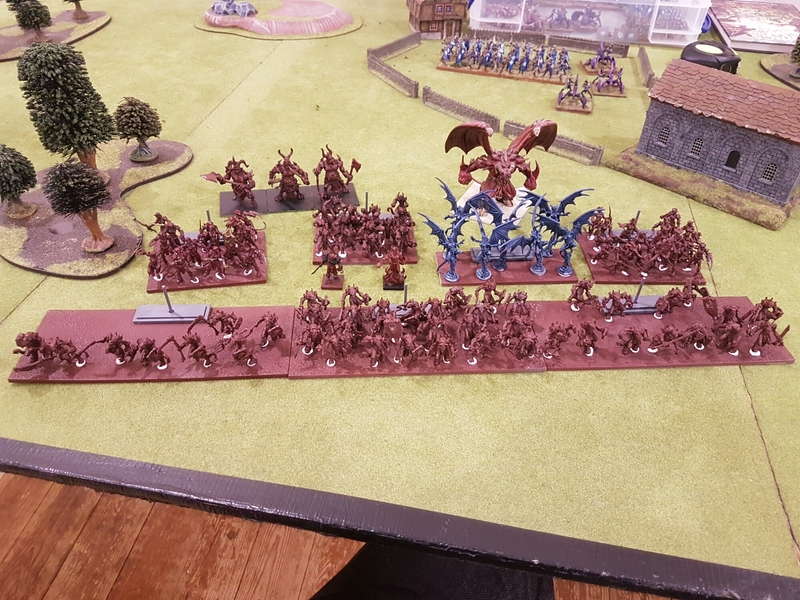 So my Gargoyles got tabled before I could so much as touch them, then flame bearers vanished as well, what as brilliant start to the game. So that was pretty much how the game panned out, leon charged two regiments of heavy cavalry into one off my hordes and ate it! 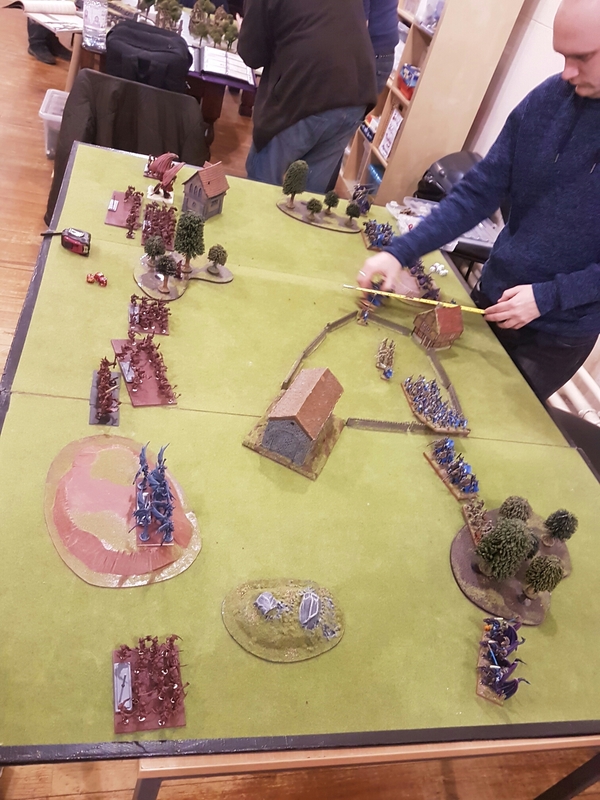 Litterally so as one regiment went off looking for my Greater Abysal and subsequently died, I repaid the favour with my 2nd line horde, who whilst being victorious took there time about it, three rounds of combat I think it was. On the right flank my succumbi regiment and molochs kept a reasonable amount of Leon’s force busy, or was he keeping mine busy, so they took no part in the game other than running round in circles. On the left flank my succumbi never really got up to a great deal, they shielded my Greater Abysal for a turn threatened some cavalry and that was about it until late game making a break for the center of the table, to little to late. The Greater Abysal once he had picked apart the Heavy Cavalry went on to chew a war machine to pieces before being mercilessly stuck between a rock a hard place and more warmachines so died an slow withering death, a bad trade on my part should have thrown him at the big blocks of archers. All in at fun game but definitely at learning experiance with some mistakes that I will not be making again.